Following on from the widely acclaimed The Actor and the Text - which was addressed directly to the actor - Text in Action is drawn from Cicelys group work experiences, encompassing the viewpoint of the director as well. To begin with, the author explores language from a cultural and personal perspective. In these days of management jargon and internet technology are we losing touch with the ability to communicate fully? Is the deeper imaginative world being left unexpressed? 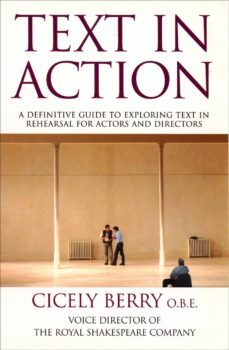 The main body of the book contains detailed, practical exercises for actors and directors during the rehearsal process. All exercises will be tied to specific scenes, leading to a fuller exploration of the rext. Text In Action analyses the imagery of plays, speech structures, the physicality of language and emphasises the importance of finding a collective voice. Cicelys guidance on the matter of voice will help actors find relationships and situations through the text in a unique way, in order to make it more dynamic and creative.